Majority of consumers have unused gift cards that can be donated to help Compassion International’s mission of releasing children from poverty. CardFunder represents a new avenue for charitable giving and enables more people to participate by giving a resource they already have – unused gift cards. 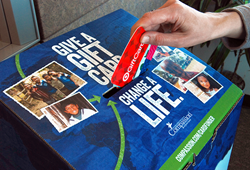 Compassion International, the world’s largest child development through sponsorship ministry, is tapping into a unique source of charitable giving – unused gift cards – with its new CardFunder® program that launched this month. Gift cards have been the most requested gift item nine years in a row, according to the National Retail Federation, but sometimes those cards go unused. In fact, a Blackhawk Network survey* showed that 51 percent of consumers currently have unused gift cards. Compassion’s CardFunder program makes it easy for individuals and groups to turn their unspent gift cards into charitable donations. Individuals can make an online donation by entering their gift card information at Compassion.com/CardFunder. Large groups, such as youth groups, businesses and service organizations, may host CardFunder drives to physically collect gift cards and send them to Compassion as one large donation. Visit the CardFunder web site, Compassion.com/CardFunder, to download information and tools. *Blackhawk’s Exchange Survey is an Internet-based survey conducted by Blackhawk Network in September 2015. The sample size included 1,100 American respondents. Compassion International is the world’s leading authority in holistic child development through sponsorship. Compassion revolutionized the fight against global poverty by working exclusively with the Church to develop children out of poverty to become responsible, fulfilled Christian adults. It is the only child sponsorship program to be validated through independent, empirical research. Compassion partners with more than 7,000 churches in 26 countries to release 1.8 million babies, children and students from poverty in Jesus’ name. For more information on the ministry, visit compassion.com or follow them on Twitter at @compassion.